Book Review: A Court Of Mist And Fury by Sarah J Maas. When it comes to reading, if I'm not in the mood then I just won't do it and unfortunately throughout the month of May, I found myself in a position when I just couldn't get into a single book. Which, quite frankly, was extremely annoying as I'd been waiting for this release since obsessing over the first book back in May 2015. However as we're now nearing the end of June I could feel the need to fall in love with a book coming back to me, and where better to start than one of my most anticipated reads of 2016: A Court of Mist and Fury by the wonderful Sarah J Maas. If you're new to my blog or just haven't read one of my book reviews before, as always I'll start with a non spoiler section, give you guys the blurb and a snapshot into my general thoughts and feelings. But before all of that I did just want to add that ACOMAF is the second book in a trilogy so if you haven't read the first: A Court of Thorns and Roses I would highly recommend doing so before pursuing this any further. As someone who has read pretty much everything Sarah J Maas has ever published I had high hopes - extremely high hopes - for this book. And let me tell you: she did not disappoint! 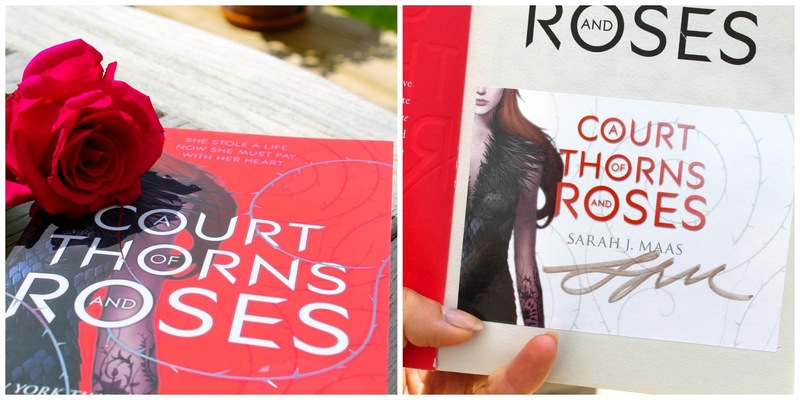 I've already expressed just how much I adored ACOTAR (I've read it three times so far!) but I can honestly say that this book took it to a whole new level. The world building was beautiful, the descriptions of places and people: utterly sublime and the dialogue: at times funny, at times emotional - it really was everything I'd hoped for and more. Would I recommend this to someone who was only just starting to read fantasy? Probably, yes. Initially I wasn't sure as there is a lot to take in however I think the way the characters are written and the humorous tone of the dialogue would make this a great series to get going with. The only thing I would say regarding new readers is that... there are certain scenes of a er sexual nature in this book so maybe it's not a good one if you're below sixteen. But then again, don't let this put you off because they are (sort of) few and far between and the majority of the story isn't like that. Now onto my general rating: I would give this book 5 stars and a 98% - which is my joint highest book rating on the blog so far! As I said above if you haven't read this book and don't want to be spoiled, then I would suggest leaving now! But feel free to return once you've read it and we can discuss in the comments because I'm full of feels right now and need to vent! Okay, so the book kicks of three months after the end of ACOTAR. Feyre is back to living in the Spring Court with Tamlin and Lucien where she is constantly plagued by horrific nightmares of Under the Mountain. I have to say that my general opinion of Tamlin started fairly low in this book (note: he didn't even bother making sure she was okay after she woke up screaming and throwing up...) and got progressively lower. In fact, by the end I was so severely pissed off at him I just wished the King of Hybern had accidentally killed him. The way he treated Feyre, locking her up, belittling her almost, was so uncalled for, and whilst I could see why he was doing it, it didn't make it right. Now of course we have to talk about Rhysand. I was one of the few people who actually liked him in ACOTAR - serious Damon Salvatore vibes - so when he was revealed to be literally the most selfless, amazing person I was so happy. His relationship with Feyre was so healthy, he never forced her to do anything, never pushed her, never made decisions for her, and yet it all worked so much better than when Tamlin had tried to keep her from harm. Just the way he had kept Velaris a secret from Amarantha all those years, by lying and pretending to be something totally hideous just showed how much he loved and cared for his Court of Dreams. Seriously, I would live there. Like, can I move to Velaris and low key marry Rhysand?! Lastly I wanted to talk a little bit about the horde of new characters we got to interact with in ACOMAF. Firstly there is the insatiably stunning Mor - who I just loved. It's so refreshing to find a female character in YA without an agenda *cough* Ianthe *cough* and she was just so brave and loving. Hearing her story of what happened when she was younger just mad me feel physically sick, and it's testament to her strength of character than she managed to be civil to her family and their Court. And then we met Cassian and Azriel: holy hell, I adored these two. I probably preferred Azriel and seriously ship him and Mor together, but they were both such great, humorous additions to the story. I'm not sure if this is being set up to be a thing, but does anyone else think Cassian and Nesta would be a great fit for one another?! I think the way Sarah J Maas writes characters is so beautiful. She absolutely fills them to the brim with history and personality and makes you genuinely care for their wellbeing. Personally I love this series more than Throne of Glass but they're both equally amazing and I cannot wait to see what future books have in store. As always I would love to hear what you guys think, so please drop me a comment! YES! The second this post came up on my feed, I was thinking "Finally!! Someone who understands!" I absolutely LOVED ACOMAF. On goodreads (username: jasmineriel, add me if you have), I gave ACOTAR 5 stars, but if I could, I'd give ACOMAF 5+. I didn't even think that was possible since I loved the first one so much. Since the first book, I've loved Rhysand and the second book proved me right. This is the first series I've read by SJM and I agree - her characters have so much depth and history which makes the story particularly fascinating and addicting.